It’s no secret Uber drivers can have it rough — they have high turnover rates, are beholden to a rating system, and frequently have to work long hours to offset the cost of driving. Now Financial Times is giving you the chance to live that life and see if you can succeed where so many simply get weighed down by the burden. 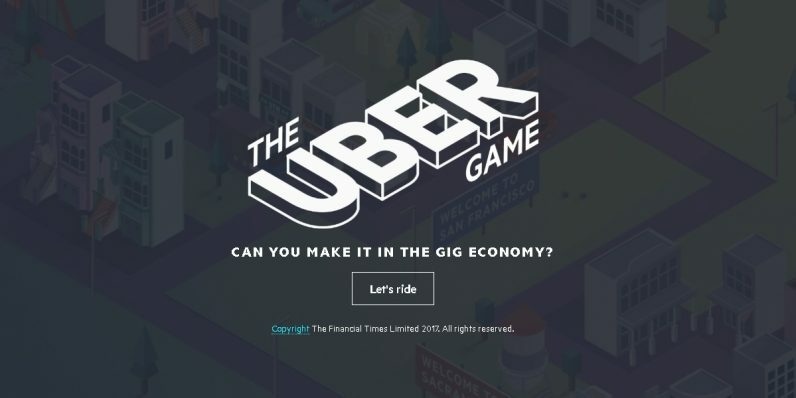 As a supplement to its story, “Uber: The uncomfortable view from the driving seat,” FT created “The Uber Game.” In this game, you try to make ends meet by driving for Uber. The game claims to be “based on real reporting, including interviews with dozens of Uber drivers,” and is intended to show what life is like for Uber drivers under pressure to work as much as possible. If it’s a game, then we’re going to give it the game treatment. Here’s what we thought of The Uber Game. In the game, you play Uber Driver, a luckless human being who has kids to feed and a $1,000 mortgage payment coming up in a week — so you’re hitting the streets hoping to make enough money in fares to keep yourself in the green. You have the option to play on “Easier,” and “Harder” difficulties. In the former scenario, you have good credit and can afford to live in San Francisco (though presumably still with the $1,000 mortgage payment), while in the latter you have bad credit and must live in Sacramento. From there, you must choose the right options to maximize your earnings, from choosing to buy a car charger and a data plan to working longer hours to hit bonus quests for extra cash. At the end of the game, your profits are measured against your costs, and presumably if you hit that $1,000 profit you can make your mortgage payment. I say “presumably” because I played the game through several times and never actually made the right amount. I’m going to assume, given the content of the article this game is part of, that this is the intention: to show the crushing stress and ultimate nihilism that faces the professional Uber driver. Heady stuff, but it’s still pretty frustrating on the level of basic gratification. The game is a text-based adventure, closer to a visual novel than an actual game. You don’t get to actually do the driving, which is disappointing — I was kind of hoping I’d get to zoom across the city, Crazy Taxi-style in order to get as many customers as possible. But I suppose the thankless plodding from point A to point B is as immersive a simulation of an Uber driver’s life as any. Despite an in-game tutorial showing you how to make nice with your customer, you only interact with your customers a few times. For the most part, a counter at the end of the day ticks up, showing you how many fares you picked up and how much you earned. Those are set, too, meaning you can’t get a lucky day and drive twenty customers unless the game has such an event scripted for that day. Trying to balance resources, a staple of time management games, is difficult, as you must weigh whether paying out of pocket for vehicle repairs or a phone mount is worth not getting dinged by picky customers. If the intention was to make me resent those fickle people I have chauffeur around, then it has succeeded. The cartoon art style serves its purpose of making the game look more cheerful than the subject matter actually permits. It’s not really my cup of tea — a little too pop art for my tastes. But it gets the job done. It does seem a little odd to me that this iteration of San Francisco is only a few blocks across. There’s stylized, and then there’s condensed-to-the-point-of-a-singularity. Overall, for a free game created specifically to send a message about the life of an Uber driver, I’d say it’s pretty good. 7/10, and go play it when you have a few minutes. Maybe you’ll make the money where I failed so many times. Maybe you’ll be awakened to the struggle of Uber’s drivers. At the very least, you’ll only have wasted a few minutes.